Spoil yourself and indulge in the fabulous aroma with our twin pack. Choose any of the two magical fragrances. Use both for yourself or gift one to your partner, family member or a friend. You can’t go wrong with this value pack. Buy 2 for $35. Box is for illustration purposes only, not actually included in the package. 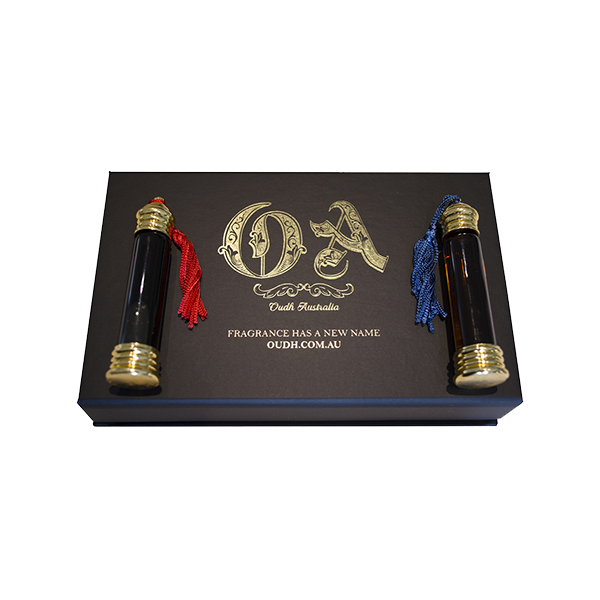 Oudh Australia has handcrafted the magical fusion of Oudh with some of mother nature’s best organic fragrances, such as saffron, sandalwood and jasmium sambac oil to bring you a limited release of 5 fragrances. Oudh oil, an ancient hidden treasure of fragrance, has been treasured for centuries as liquid gold. It is harvested from the Agar tree, originating in the Assam region of India, over time it has spread throughout South East Asia. With a unique fragrance, perfumers highly value this oil’s sweet, woody and complex aroma, which lasts three to five times longer than standard perfumes. As a non-irritant that is alcohol and chemical free, this is 100 per cent organic , it can be applied directly to the skin, or as a base note for perfume compositions.